Although Mike Yarwood was one of the kings of 1970’s light entertainment television, his profile has remained fairly low during the last few decades – mainly because few of his shows are commercially available or receive television airings. Selected Morecambe & Wise and Two Ronnies Christmas Specials pop up in the schedules each year, but Yarwood (whose 1977 Christmas Special achieved a record rating of twenty eight million – just narrowly beating that year’s Morecambe & Wise show) has tended to remain trapped in the archives. Maybe this is due to concerns that some of his impersonations are too obscure for modern audiences or possibly his brand of humour just seems too bland and middle of the road. I’d love to see a run of his work for the BBC in the 1970’s – as that’s generally held to be his strongest – but as it’s not available the next best thing is the DVD It’s Mike Yarwood. 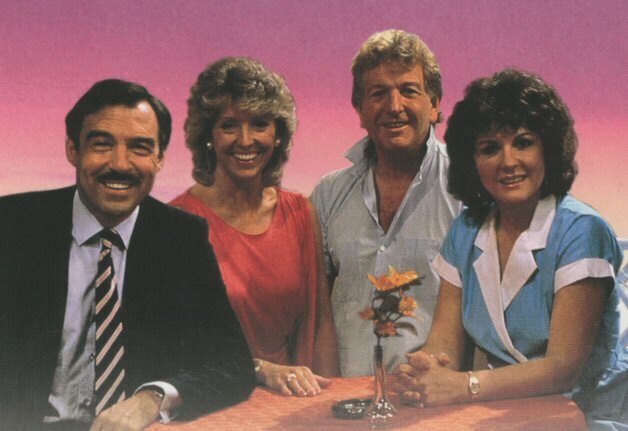 Released by Fremantle in 2007, it contains four shows that he made for Thames between 1982 and 1984 as well as a documentary from 1984 – Mike Yarwood: This Is Him. The documentary is by far the best thing on the DVD, as it offers a well-observed insight into both the man and the mechanics of how his television programmes were put together. It’s possible to sense from the 1984 interview material that he knew his time was nearly up. Like Morecambe & Wise, Yarwood’s move from the BBC to Thames wasn’t the happiest of periods in his professional life. Thames had the practical resources to match the BBC, but for both M&W and Yarwood the spark seems to have gone. In M&W’s case it was age – Eric Morecambe’s health became a major limiting factor – whilst Yarwood struggled with the brave new world of the 1980’s. Many of Yarwood’s favourite subjects (especially Harold Wilson) were no longer central figures in British culture – although that didn’t prevent him from continuing to mimic them. As he struggled to find new people to add to his act, there was also the question of material. In the This Is Him documentary, Yarwood comments that he could never impersonate anybody he didn’t like – and his gentle mockery would seem increasingly out of place as the alternative comedy boom of the 1980’s wore on. The next generation of impressionists, such as Rory Bremner, offered more caustic political commentary which was a world away from Yarwood’s style. Struggles with stage-fright and alcohol were other reasons why Yarwood gradually faded from the public view. He seemed to have been a generous performer though – witness the sketch where he plays Prince Charles. Suzanne Danielle is Princess Diana and the pair are interviewed by Selina Scott. Danielle gets several of the best lines and the biggest laughs (it’s easy to imagine some of his contemporaries wouldn’t have been happy with this and would have insisted on some rewrites to redress the balance). Christmas at the White House sees Yarwood play Ronald Reagan, Sammy Davies Jnr, George Burns and Frank Sinatra. This sequence offers more proof that his style remained rooted in previous decades (he could have impersonated Davies Jnr, Burns and Sinatra in the 1960’s or 1970’s just as effectively). During the last ten minutes he does some stand-up impersonations in front of the studio audience. There’s few props (just the odd hat and chair) but it’s easily the best part of the show. His subjects remain established figures – Bob Hope, Ken Dodd, Max Bygraves, Frankie Vaughan, Dave Allen – but there’s something about his direct connection with the audience that works really well. Had there been more of that (and less of the elaborate make-up) then the show would undoubtedly have been better, but Mike Yarwood’s Christmas Show is still a diverting way to spend fifty minutes. Incredibly popular in its day, Duty Free is a series that has aged pretty well. Yes, it’s predictable stuff, but the regulars (particularly Keith Barron and Gwen Taylor) are so good that they can, and do, lift the sometimes thin material. The first series is by far the best, particularly once Amy (Taylor) discovers her husband, David (Barron) has been involved with Linda (Joanna Van Gyseghem). Rather endearingly, David and Linda’s affair never seemed to have progressed beyond holding hands and the odd clinch. Like the Carry On films, frustration is the name of the game. But after Amy learns the truth, Taylor has some wonderful scenes that have a little more depth than might have been expected. Gwen Taylor is the star player throughout the run, and never more so than here. The second and third series tend to stretch the love triangle to breaking point, but they still have their moments. Not ground-breaking then, but certainly an enjoyable watch.